We study multiple myeloma, the second most frequently diagnosed hematologic cancer in the United States. Many genes contain blueprints for proteins, but many others have the blueprints for molecules called miRNAs that do not code for proteins. These miRNAs, however, are quite important in regulating genes and are clearly involved in the development and progression of cancer, as well as other diseases. Right now, we have several projects that focus on the roles of miRNA in multiple myeloma. We are investigating how miRNA-222-221 initiates the growth and further development of multiple myeloma. In addition, we are identifying novel genes and miRNAs involved in the development of multiple myeloma. Finally, because testing potential new drugs requires models that resemble the human disease as closely as possible, we are developing a new mouse model that recapitulates human multiple myeloma for preclinical studies. Lin J, Hu Y, Zhao JJ. Single wall carbon nanotube (SWCNT) delivered MALAT1 antisense oligo represses MM cell growth in vivo. Jove. 2018 July 31. e58598, doi:10.3791/58598. http://www.jove.com/video/58598. Hu Y, Lin J, Fang H, Fang J, Li C, Chen W, Liu S, Ondrejka S, Gong Z, Maciejewski J, Reu F, Yi Q, Zhao JJ. Targeting the MALAT1/PARP1/LIG3 complex induces DNA damage and apoptosis in multiple myeloma. Leukemia. 2018 Oct; 32(10):2250-2262. doi: 10.1038/s41375-018-0104-2. Epub 2018 Mar 22. PMID: 29632340. PMCID: PMC6151178. Liu S, An J, Lin J, Liu Y, Bao L, Zhang W, Zhao JJ. Single nucleotide polymorphisms of microRNA processing machinery genes and outcome of hepatocellular carcinoma. Plos One. 2014 Mar 27;9(3):e92791. Zhao JJ, Chu ZB, Hu Y, Lin J, Wang Z, Jiang M, Chen M, Wang X, Zhou Y, Chonghaile TN, Johncilla ME, Tai YT, Cheng JQ, Letai A, Munshi NC, Anderson KC, Carrasco RD. Targeting the miR-221-222/PUMA/BAK/BAX pathway abrogates dexamethasone resistance in multiple myeloma. Cancer Research. 2015 Oct 15;75(20):4384-97. Zhu D, Wang Z, Zhao JJ, Calimeri T, Meng J, Hideshima T, Fulciniti M, Kang Y, Ficarro SB, Tai YT, Hunter Z, McMillin D, Tong H, Mitsiades CS, Wu CJ, Treon SP, Dorfman DM, Pinkus G, Munshi NC, Tassone P, Marto JA, Anderson KC, Carrasco RD. The Cyclophilin A-CD147 complex promotes the proliferation and homing of multiple myeloma cells. Nature Medicine. 2015 Jun;21(6):572-80. Zhao JJ, Lin J, Zhu D, Wang X, Brooks D, Chen M, Chu ZB, Takada K, Ciccarelli B, Admin S, Tao J, Tai YZ, Treon S, Pinkus G, Kuo WP, Hideshima T, Bouxsein M, Munshi N, Anderson K, Carrasco DR. miR-30-5p functions as a tumor suppressor and novel therapeutic tool by targeting the oncogenic Wnt/β-catenin/BCL9 pathway. Cancer Research. 2014 Mar 15;74(6):1801-13. Tian Z, Zhao JJ, Tai YZ, Amin S, Hu Y, Richardson PG, Anderson KC. Investigational agent MLN9708 targets tumor suppressor microRNA-33b in multiple myeloma cells. Blood. 2012 Nov 8;120(19):3958-67. Takada K, Zhu D, Bird G, Sukhdeo K, Zhao JJ, Mani M, Lemieux M, Carrasco D, Horst D, Fulciniti M, Munshi N, Xu W, Kung A, Shivdasani R, Walensky L, Carrasco DR. Targeted Disruption of the BCL9/β-catenin Complex Inhibits Oncogenic Wnt Signaling. Science Translational Medicine. 2012; 4:148, p. 148ra117. Tai YT, Chang BY, Kong SY, Fulciniti M, Yang G, Calle Y, Hu Y, Lin J, Zhao JJ, Cagnetta A, Cea M, Sellitto MA, Zhong MY, Wang Q, Acharya C, Carrasco DR, Buggy JJ, Elias L, Treon SP, Matsui W, Richardson P, Munshi NC, Anderson KC. Bruton tyrosine kinase inhibition is a novel therapeutic strategy targeting tumor in the bone marrow microenvironment in multiple myeloma. Blood. 2012 Aug 30;120(9):1877-87. Lin J, Lwin T, Zhao JJ, Tam W, Choi YS, Moscinski LC, Dalton WS, Sotomayor EM, Wright KL, Tao J. Follicular dendritic cell-induced microRNA-mediated upregulation of PRDM1 and downregulation of BCL-6 in non-Hodgkin's B-cell lymphomas. Leukemia. 2011, Jan;25(1):145-52. Zhao JJ, Lin J, Lwin Tint, Guo J, Dalton SW, Sotomayor E, Tao J, Cheng JQ. microRNA expression profile and identification of miR-29 as a prognostic marker and pathogenetic factor by targeting CDK6 in mantle cell lymphoma. Blood. 2010, 1; 115(13): 2630-9. 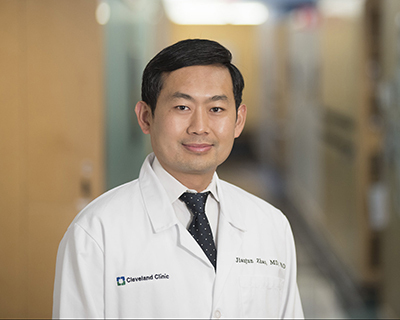 Lerner Research Institute’s Jianjun Zhao, MD, PhD, was recently awarded a two-year, $200,000 grant from the V Foundation for his research on the genetic underpinnings of multiple myeloma.